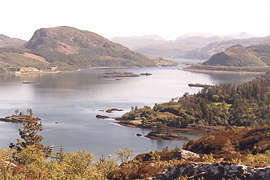 Although not appearing in Hamish Macbeth the views from this hill behind Plockton are excellent and should be tried if you have neither the time or the inclination to walk to the top of Carn á Bhealaich Mhóir. Nearby also is the section of road which appears in the opening scenes of several episodes of the third series of Hamish Macbeth. You can either drive,or if feeling more energetic, walk to the summit of this hill which has fine views over Plockton, Loch Carron and Skye. From the car park in Plockton turn left and head back up the road out of the village. 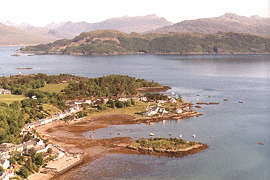 After a hundred yards or so you will pass Plockton Primary School which was used as Esme's school in the series. At the top of the hill you will pass nearby the station. Carry on the main road out of the village until you reach the first road on the left which goes to Duncraig Castle. Follow this road and after a mile or so you will reach it's highest point. There is space to park on the left. A somewhat indistinct track heads off on the left to the top of Creag nan Garadh. The climb to the summit is easy and the reward on a clear day are some stunning views. On your return from the summit of Creag nan Garadh continue along the road away from Plockton and down the hill slightly for a few hundred yards to reach the spot which appears in the opening scenes of "The Honourable Policeman" (view across Loch, signpost to Lochdubh 1 mile, and car) and "More than a game" (view across Loch and motorbike).